I loved a festival called Simchat Torah in which people danced in the synagogue, holding branches of palm and a... and a citrus fruit. I... I would like to have more religious practice in my life, but, in fact, I really don’t... don't have any. Certainly... I don’t know if my parents had any religious belief. It was never discussed. The house was kosher, the orthodoxies were observed, but I don’t know whether they were ever... ever believed in. In general, I think, Judaism does not enjoin nor enforce belief in the same way, say, as Catholicism. You don’t have to swallow a Trinity, you don’t have to swallow an afterlife, you may not even have to swallow a God. Basically, I think, it’s a rather ethical religion of, sort of, behave yourself down here, although there are certain cosmic things that if you... that a wrong deed will resonate throughout the universe, but so will a right deed. 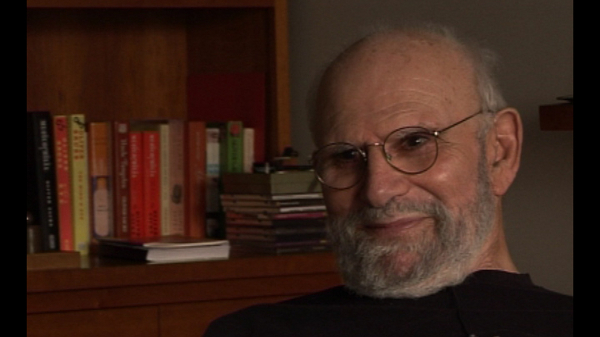 Oliver Sacks (1933-2015) was born in England. Having obtained his medical degree at Oxford University, he moved to the USA. There he worked as a consultant neurologist at Beth Abraham Hospital where in 1966, he encountered a group of survivors of the global sleepy sickness of 1916-1927. Sacks treated these patients with the then-experimental drug L-Dopa producing astounding results which he described in his book Awakenings. Further cases of neurological disorders were described by Sacks with exceptional sympathy in another major book entitled The Man Who Mistook His Wife For A Hat which became an instant best seller on its publication in 1985. His other books drew on his rich experiences as a neurologist gleaned over almost five decades of professional practice. Sacks's work was recognized by prestigious institutions which awarded him numerous honours and prizes. These included the Lewis Thomas Prize given by Rockefeller University, which recognizes the scientist as poet. He was an honorary fellow of both the American Academy of Arts and Letters and the American Academy of Arts and Sciences, and held honorary degrees from many universities, including Oxford, the Karolinska Institute, Georgetown, Bard, Gallaudet, Tufts, and the Catholic University of Peru. Kate Edgar, previously Managing Editor at the Summit Books division of Simon and Schuster, began working with Oliver Sacks in 1983. She has served as editor and researcher on all of his books, and has been closely involved with various films and adaptations based on his work. As friend, assistant, and collaborator, she has accompanied Dr Sacks on many adventures around the world, clinical and otherwise.